Now you can get this best-selling eBook for Nearly 40% Less Than 25,000 Other People Paid! and give you a chance overcome those miserable odds and get exactly what you want. "Great, Stuart! I'm convinced that when you teach people your technique one-on-one it's very effective. But I still haven't seen any proof that reading your ebook is going to do anything for me." "I thank you for all your outstanding work and how you've helped me to achieve and pull out of a very challenging previous 18 months." even as your left brain is playing the brand-new "Weight-Loss Concerto" and your right brain is trying hard to keep up - your mid-brain (emotions) is spinning a disk that plays the "same old song": "Do the Mashed Potato!" For the first time since I developed Cybernetic Transposition, you can take full advantage of my techniques to get what you want, more easily and with more certainty than ever before. 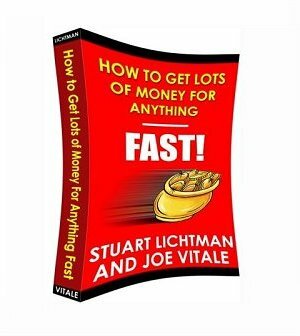 My new ebook, co-authored by #1 best-selling author Joe Vitale, is called How to Get Lots of Money for Anything - Fast! Now you do! Isn't it reassuring to know that all that's standing between you and money is a technique that's been tested, refined and perfected (and proven) with 80,000 people around the world? In fact, they typically hired me for six days of training at a time — and would send me a check for $150,000. I have already been paid handsomely many, many times for this valuable methodology. Now I want to put it in the hands of as many people as possible. So I'm pricing this one-of-a-kind information at only $149.50 - conservatively, about one-tenth of what it's worth. UPDATE-SPECIAL OFFER: I want you to understand - over 25,000 people have paid $79.50. But you can get it now for only $49.50! BONUS #1: Six audio segments that lead you through the six most repeatedly used Super Achievement Processes described in my book. Also included: easy to use, printable forms to help you learn the techniques more quickly. You'll get the same quality and depth of material directly from your computer that corporate students (whose companies paid an average of $4,500 apiece to train) got in their trainings. Also included: easy-to-use, printable forms to help you learn the techniques more quickly. By now, you've only seen a glimpse of the tremendous value in this package. Take this opportunity to get the full benefits of this unique information. Here's an even better deal for you! The newly-released 2nd Edition includes major upgrades to make it even easier and faster to achieve any goal - even seemingly "impossible" ones! The 2nd Edition has 12 new chapters (161 additional pages) and answers virtually every question Stuart has been asked since the 1st edition was released. All 14 Bonuses, the 6 Audio Guides to lead you through the processes are updated to make the information much easier to implement. You get 6 brand-new key processes that make it much easier and faster to move past obstacles and directly to what you want to achieve. All forms to walk you through the Cybernetic Transposition technique processes, step by step, have been upgraded. They're now far more detailed and much easier to use! Never before released: A brand new professionally recorded AudioBook (every word of the eBook included) You can download it to your computer, iPhone or mp3 player, so you can learn "on the go" - whether driving, walking, jogging or working out! This is important because multiple learning modes greatly expand most people's ability to understand and take full advantage of the Cybernetic Transposition technique. And combined with the expanded and improved explanations. the questions and answers. the improved forms and audio guides. and the 6 powerful new processes. this is your best opportunity EVER to harness the full power of the Cybernetic Transposition technique - and attain your most cherished desires. The regular price for this package is a very reasonable $129.50. But today, you can get all this for one payment of $97.! Of course, you are still protected by our unconditional 60-day money-back guarantee. Second Edition Package: Single Payment of $97.